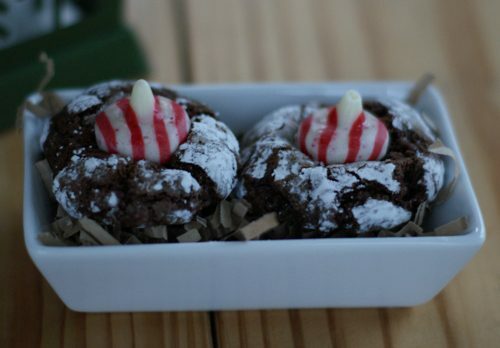 A couple of years ago, I decided to dress up my chocolate crinkle cookies with a candy cane kiss, and the resulting cookie was a hit. 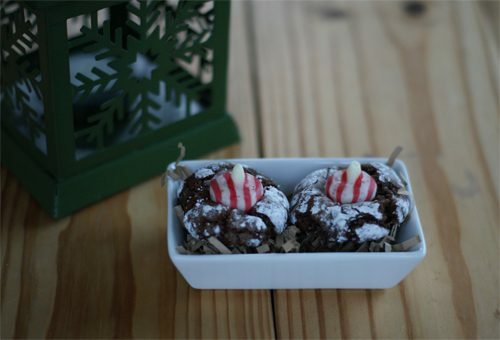 It’s extremely rich, but the combination of chocolate and peppermint is downright addicting! Like peanut butter blossoms, these are really easy to make, although I have found that the chocolate dough is stickier and ends up coating my hands as I roll the balls of cookie dough. It’s well worth it for the final result, though. P.S. Note that these need to chill for at least four hours. You don’t want to start making them at, say, 6:30 at night for a Christmas party the next day unless you want to be in the kitchen until 11 p.m. You’re welcome. In a medium bowl, mix together cocoa, white sugar, and vegetable oil. Beat in eggs one at a time, then stir in the vanilla. Combine the flour, baking powder, and salt in a separate bowl, and then stir into the cocoa mixture. Cover dough, and chill for at least 4 hours. Use a melon baller to shape dough into 1-inch balls. Roll each ball in confectioners sugar and place on ungreased cookie sheet. Note: If your dough starts to get too sticky, stick it in the freezer for a few minutes. Unwrap chocolates while you wait and immediately press one into center of each cookie. The cookie will crack around the edges as you do. Move to a wire rack to cool.